The Midnite Drive-In: Friends to the End? Only one comedy acting duo has managed to stand the test of time and appeal to all generations throughout the ages. Laurel and Hardy, Abbott and Costello, Martin and Lewis. All had their days during their run in Hollywood. But try showing them to kids and young adults of today and you may just as likely get a yawn as a laugh. 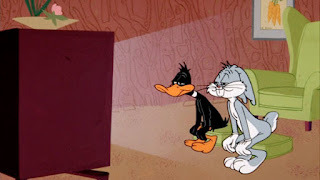 On the other hand, show a Bugs Bunny/ Daffy Duck cartoon and only the most cynical of octogenarians will not get a chuckle at the antics on screen. Over the course of roughly 13 years, from 1951-1964, the duo teamed together to make some of the best cartoons Warner Brothers Studios ever put on the screen. Unlike most comedy team duos like Abbott and Costello, and Martin and Lewis, the comedy duo of Daffy and Bugs rarely got along on screen. Also unlike those others, the friendship off screen never deteriorated into a rancorous relationship. Even after they parted ways as an on-screen team, the two remained lifelong friends, and even got together for more on screen antics later in life, including several full-length Looney Tunes movies. Beginning with Rabbit Fire (which coupled with Rabbit Seasoning and Duck! Rabbit, Duck! comprise what is known as the "Hunter's trilogy"), Bugs and Daffy played the classic straight man/comic duo that their predecessors such as Abbott/Costello and Laurel/Hardy did, but with much more exaggerated antics, since they were cartoons and could be blown up/shot/fall off cliffs with impunity. Rabbit Fire: was the first pairing of Bugs and Daffy. Elmer Fudd is out in the woods and sneaking along hunting wabbit (as in "Shhh. Be vewy vewy quiet. I'm hunting wabbit. 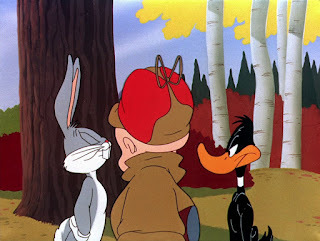 Hahahaha") Bugs an Daffy go after each other trying to convince Elmer is alternately either duck season or rabbit season. Some of the classic gags include Bugs accusing Elmer of hunting rabbits with an elephant gun, and then telling him to go shoot an elephant. And behind Elmer is an elephant who responds (in a Joe Besser of the three Stooges voice) "You do and I'll give you such a pinch!" 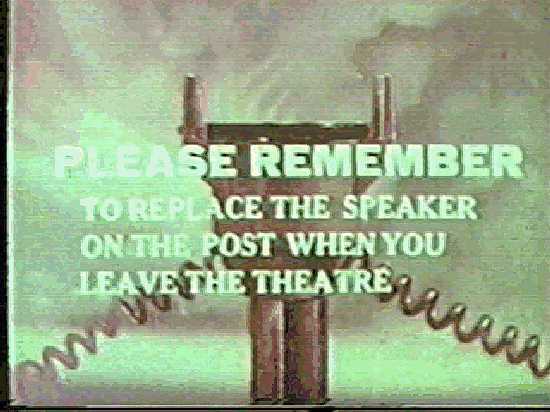 The show ends with Bugs and Daffy tearing off posters on a tree, shouting "Duck Season!" "Rabbit Season" until the final poster reveals a picture of Elmer and the words Elmer Season. Elmer takes off like a rocket and Bugs and Daffy follow. "Shhh. Be vewy vewy quiet. We're hunting Elmers.... Hahahaha." Rabbit Seasoning: was the second in the so-called Hunter trilogy. This one had Daffy trying to convince Elmer that it's rabbit season when it's really duck season. The main gag involves a repartee between Bugs an Daffy which has Bugs tricking Daffy into saying "and I say he does have to shoot Me now. Shoot Me NOW!" Hmm pronoun trouble... As in the previous episode, it ends with Daffy spluttering to Bugs "You're despicable." Duck! Rabbit, Duck! : was the third entry in the trilogy once again has the two fighting over whether it's duck season or rabbit season, including a couple of scenes where Daffy calls Bugs a dirty rat and Bugs calls Daffy a dirty skunk. Daffy expostulates "I'm a dirty skunk? I'm a dirty skunk?" 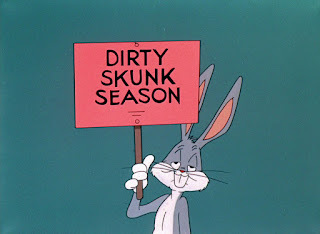 at which point Bugs holds up a sign that says "Dirty Skunk Season" and Elmer shoots Daffy. 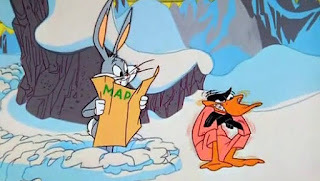 Then Daffy says "Well, I guess I'm the pigeon" and of course Bugs holds up a sign, "Pigeon Season". After Daffy loses his cool, Bugs shows up in a ranger's outfit and Elmer asks "What season is it really?" Bugs holds up a baseball and says it's baseball season, at which point Elmer exits enthusiastically shooting the baseball. The Abominable Snow Rabbit: Bugs and Daffy have been tunneling to the coast, but Bugs took a wrong turn at Albuquerque and they end up in the Himalayas. Angrily Daffy jumps back in the tunnel to return to his starting point, but runs into the foot of the Abominable Snowman, who thinks Daffy is a rabbit. Ecstatically, the Snowman picks up Daffy, exclaiming that he has a pet rabbit and that he will name him George (a reference to the character of Lenny in Of Mice and Men.) The usual chaos occurs as Daffy continually tries to get out of his predicament by redirecting his nemesis to Bugs. The Million Hare: Daffy is visiting Bugs, and is the usual annoying house guest as he watches TV instead of hanging out with Bugs. He is watching a game show that involves two friends who must race to the studio, the winner getting a million bucks. Daffy tries all sorts of shenanigans to win while Bugs plays it cool, and Daffy arrives first. But the prize is not exactly what he expected. These are just my favorites. 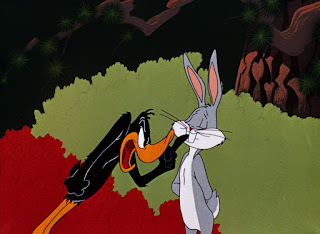 Bugs and Daffy were paired in several other WB shorts, and all of them are worth seeking out. Check them all out when you get a chance. (At only about 6 minutes each, you could watch all 15 of them in a couple of hours.) Time to ride off into the sunset, folks. Drive home safely. When it comes to dynamic film duos, few have reached the heights of these denizens of Termite Terrace. Your favourites are our favourites. The whole family stops in their tracks and is glued to the screen when there's a chance to watch Bugs and Daffy do their stuff. The lasting appeal of Bugs and Daffy made it an obvious choice. I just wish I'd had the time and ambition to have covered them all. thanks for reading. This is a fantastic choice and I love your comparison of Bugs and Daffy to other memorable duos of filmdom. 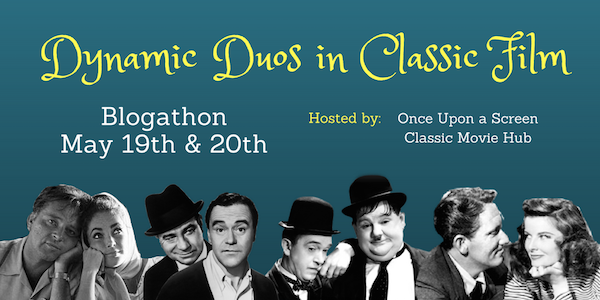 We can't do without these two and our blogathon without your entry. Thank you so much for taking part. I had fun writing it, too. Thanks for reading. 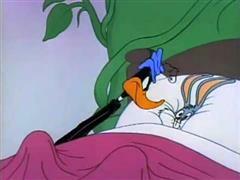 I love Bugs and Daffy. One of the best teams ever in film. And you are right, they definitely have stood the test of time. I know some people who just don't appreciate Abbott & Costello or Martin & Lewis, but I know of no one who dislikes Bugs and Daffy! And if there are i wouldn't want to meet them... :-D Thanks for reading. 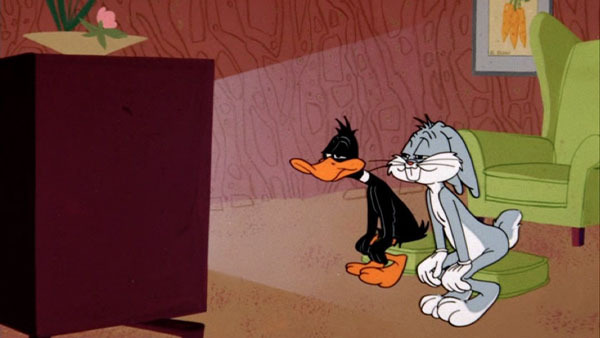 Bugs and Daffy are legends, and your essay proves why that is so. As for me, I can never get enough of these two. Legends is a good term. People will still be watching Bugs and Daffy in 2118 I bet. Thanks for reading.